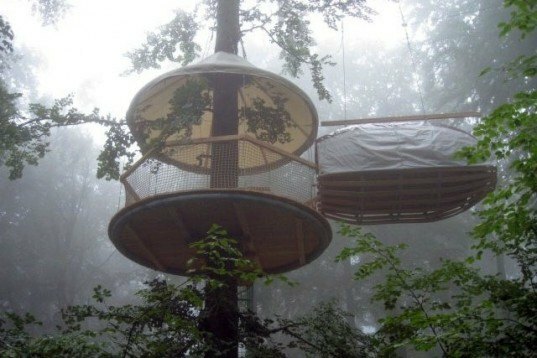 Treehouses come in all shapes and sizes, ranging from a simple platform suspended in a tree to a home with full plumbing and electrical services. 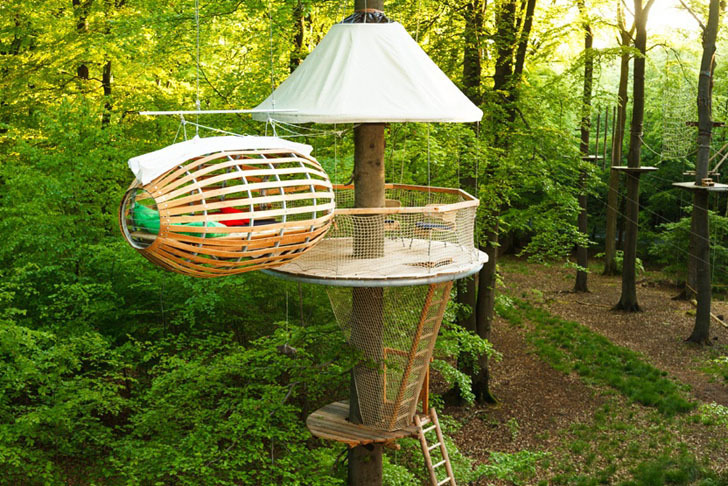 On the broad spectrum of treehouse design, the Erlebnest by German company Cambium GmBH falls somewhere in the middle. Spotted by our friends over at Treehugger, the minimalist structure consists of a large, round, open-air covered platform for dining and lounging and a smaller tube-shaped sleeping area that floats next to the main platform. Together, they combine to form one of the most inviting treehouse retreats we've seen. Cambium is a company based in German’s Allgäu region that specializes in treehouse construction, suspended rope and bridge courses, and forest climbing equipment. The Erlebnest is made of a steel frame with strips of larch wood forming the structure, and it blends into its wooded surroundings. The lounge area is big enough for a party of four, and the “cocoon” sleeping area features a king-size bed. If the weather turns while you’re in there, a large rain flap can be pulled down to protect you from the elements. Because it has no walls, the 9-square-meter Erlebnest platform affords spectacular views of the surrounding forest. The first Erlebnest has been installed in Bingen am Rhein, and Cambium plans to build six more of them next year in Lake Constance. And if you’d like to build one of these unique treehouses on your own property, the company also offers kits for sale and provides help setting them up. Cambium is a company based in German's Allgäu region that specializes in treehouse construction, suspended rope and bridge courses, and forest climbing equipment. The Erlebnest is made of a steel frame with strips of larch wood forming the structure, and it blends into its wooded surroundings. If the weather turns while you're in there, a large rain flap can be pulled down to protect you from the elements. Because it has no walls, the 9-square-meter Erlebnest platform affords spectacular views of the surrounding forest. The first Erlebnest has been installed in Bingen am Rhein, and Cambium plans to build six more of them next year in Lake Constance. The lounge area is big enough for a party of four, and the "cocoon" sleeping area features a king-size bed.